Cough - Find out why you cough, causes and types of coughs. Coughing is one of the body’s most basic defence mechanisms. We cough to expel foreign particles such as from our respiratory system, which can help to clear bacteria and viruses out of the system. 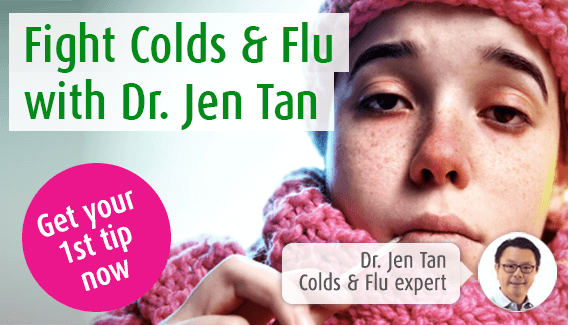 Here at A.Vogel Talks Coughs, our immune system expert Dr. Jen Tan examines the various types of coughing, describes their causes and recommends suitable herbal and home remedies to ease any discomfort or pain. If you have a question, you can use our Q&A service to ask Dr. Tan directly. A cough is the sudden expulsion of air from the passages of the respiratory tract. It serves the purpose of clearing our airways of mucus, bugs and foreign particles. Coughs are something we are familiar with. We have all used this mechanism without thinking, for instance, to clear a bit of mucus at the back of our throats before speaking. However, sometimes coughs are not controllable and come in spasms. Usually, these are caused by viral infections such as colds or flu giving rise to inflammation, triggering the cough reflex. Smoker’s cough – this is the result of long-term smoking and arises as the lungs try to clear of toxins gathering in the respiratory system. Coughing is one of the body’s protective mechanisms. It serves the purpose of keeping our respiratory system clear. The lining of our respiratory tract, from the back of our throat to the depths of our lungs, is richly supplied by nerve endings. When these are irritated, nerve signals pass to the cough centre of the brain, triggering a series of coordinated muscular actions leading to a cough. This is known as the cough reflex. The larynx (commonly known as the voice-box) is closed momentarily by the epiglottis. This is followed, almost simultaneously, by the contraction of muscles in the abdomen and chest, which builds up pressure within the upper airways. When the epiglottis relaxes again, the larynx opens and a short burst of approximately 1.5 litres of air from our lungs is released through the upper airways giving rise to the characteristic coughing sound. This blast of air has been measured at speeds of up to 50mph, pushing unwanted material out of the upper airways and also releasing up to 3,000 tiny droplets of saliva. Hayfever and other allergies can sometimes lead to a cough. This is because it can cause inflammation in the respiratory system leading to a dry or tickly cough. Antitussives – these are used for dry, tickly coughs and soothe your throat, suppressing the cough reflex. Both expectorants and anti-tussives are available as conventional medicines prescribed by your doctor or from your pharmacy, as well as licensed herbal remedies available from health food stores and pharmacies. Find out about other types of cough remedies available. If you are suffering from a dry, tickly or irritating cough then look no further than Bronchosan. This is made with extracts of freshly harvested pine shoots, as well as a touch of honey. Together these ingredients have a pleasat taste and help to ease irritation. To find local independent stores in your area that sell Bronchosan, simply type your postcode below. Whether you’ve come down with a cold or flu or just want to know what to do next time one hits, I'm here to give you lots of useful tips and tricks to help you recover. You’ll receive 8 tips, 1 each day by email, each on a different topic, from tackling your symptoms to which foods to eat and which herbal remedies can help. I also want regular tips and advice to help keep my immune system health on track & fight the misery of colds and flu. Extract of fresh spruce (pine) shoots and honey. For dry, tickly and irritating coughs. Can back pain be due to dry cough? How can I get rid of my chesty cough? Persistent coughing at night. What could be causing it? How can probiotics help the immune system?How does sleep affect the immune system?How does the immune system work?How to boost your immune systemIs the immune system still effective as we age? 8 drinks to boost the immune systemCan garlic help the immune system?Can honey cure a cold?Can vitamin C shorten a cold?Can vitamin D prevent colds and flu?Great winter meals for the immune systemHow can diet boost the immune system? A student's guide to fresher's fluBoosting immune health in teensHow do you deal with colds and flu in the lead up to exams?Tips for keeping your child's immune system strongWhy do kids get more colds than adults?